New Orleans May Day is Labor Day around the world, but the first Monday in September is labor’s day in North America. 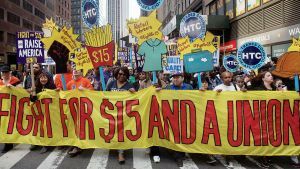 I was honored to be able to write the Labor Day post on the 10th anniversary of the Working Class Perspectives posts, so take a read there https://workingclassstudies.wordpress.com/2018/09/02/labors-day-more-or-less/. It’s hard for most of us to recall any period in the last fifty years that we could call the “good times” for labor in the U.S. Membership density in American unions has been on a steady decline. The National Labor Relations Board has certified few new unions, and mergers have become common. Almost none of the major corporate enterprises founded over the last thirty years are unionized. Legal reversals have followed these declines, and the beatings have been painful. Few were surprised that the Supreme Court ruled that unions could not require members of public sector unions to pay agency fees for bargaining and servicing, though the Janus ruling stung some unions badly. New York State and Pennsylvania already report 80,000 workers whose payments have ceased, depleting union coffers by tens of millions annually. The elimination of union security in Wisconsin has been cataclysmic. Texas will soon eliminate any payroll deductions for any public workers in any jurisdiction. This Labor Day all of us need to think about how to support workers moving forward and unions embracing the future. No sense in whining, when we could be winning. Our first order of business has to be to get to work and make the work matter to workers, their communities, and the larger world where the public is willing to support us — if we are just willing to take the risks and do the work to take our fights to them and ask for their support. This entry was posted in Labor Organizing and tagged Labor Day, labor unions, Working Class Perspectives, working families by Wade. Bookmark the permalink.